Every culture approaches pup play in a unique way, and we present here a path to puphood drawing from the centre of the Orient. For explanation as to why we do this, follow this link. The middle kingdom, China, has an ancient history that is unique and special, and can offer great insight into pup play for us all. The Chinese have always considered the dog to be the paragon of loyalty and virtue. 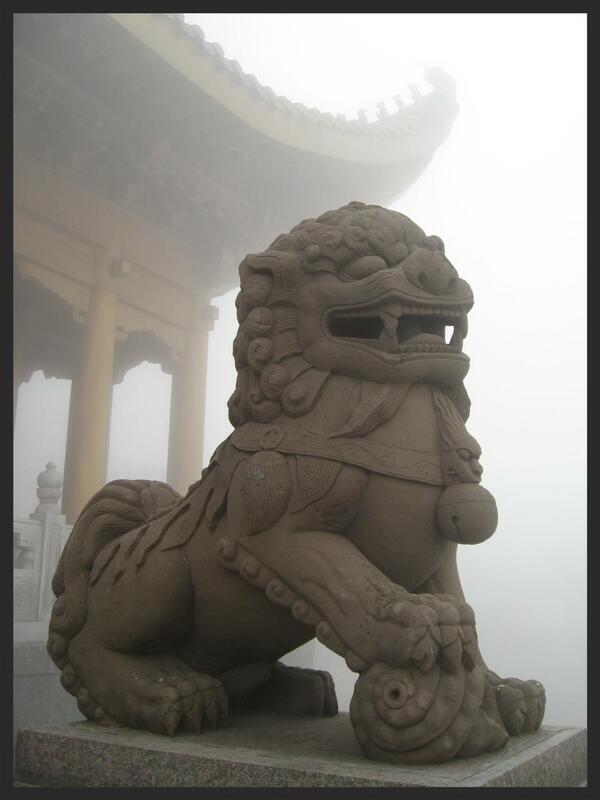 It is a dog-like lion that guards all temple gates and path to heaven. The emulation of an animal may at first seem bizarre to Chinese sensibilities, but as we explore what it is to be a Chinese Human Pup we find the Proper Pup can exemplify what is Correct and Right for a person. Working from Confucius - The Analects - and Chinese Zen teachings, we present here a modern update for human pup play. Look to the four corners of your pup world and build of yourself a home for your pup self. Imagine your Puphood as being a tree.... when you plant a tree and take care of it, you do not see it increase, but in time it gets big. It is so with becoming a human pup, and developing pup headspace. When you accumulate pup headspace with continued practice, you do not see the good of it immediately, but in time your training and practice will kick in and it will function. If you abandon pup training and go against your Trainers instructions you will not see the results you wish. The Proper Pup devotes his efforts to his roots, to the base of the tree of puphood from which he springs. Once the basis of puphood, your roots are established, being a Proper Pup will grow from that. Being good as a human pup and obedient is the foremost root. All grows from that point. So approach your training and and pup activities with reverence and be trustworthy, for your honesty of expression as a pup is everything. There should be no action a Proper Pup has taken that he cannot repeat. A pups heart has no regrets, having always been upright and trustworthy and his actions true to his heart and word. What you have done you allow to represent you faithfully and you can stand by your words as they represent you as a Proper Pup. A Proper Pup avoids excess in the things he needs as a pup. You are proud to utilise the essentials of gear, knowing that a practical use of gear is far worthier than a throwaway item for momentary pleasure. The labour of others is respected by a Proper Pup, for you expect others to do tasks or work for you only when it is appropriate and customary. For example, a Bootblack should shine your shoes, for it is his vocation - your fellow pups should not shine your shoes, for it is inappropriate. A Proper Pup is not lazy and exploits others to do what he can do rightly himself as appropriate. A Proper pup should be a good pup in private, and an obedient pup in public. He is sparing of sounds, and has a quiet controlled demeanour. When he does make sounds, when a Proper Pup speaks, his words are trustworthy and can be heard. A Proper Pup has a simple guide to all his words and deeds - what can be said, but not practised or acted upon, is better not said. What can be practised but not spoken of is better not done at all. When you utter words pup, you should always consider their end, of what effect they will have others. A Proper pup enjoys having an audience, but cultivates the friendship of fellow pups, not the adoration of a crowd. And you will not accept as a friend anyone who is not as good as you. If a pup has any energy to spare from all this action, he devotes that spare time and energy to making himself better. There are four subjects of learning and improvement for the Proper Pup - Culture, Moral Conduct, Perfection, and Trustworthy Speech. These are the pursuits of excellence a Proper Pup will strive at to be superior to lesser pups.